It's my pleasure to welcome Trish Milburn back to The Romance Dish today. 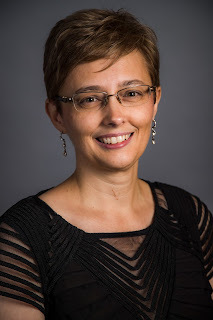 Those of you who have been with us from the beginning know the important part Trish played here, both in helping us get the blog off the ground and as a monthly contributor. Trish is a Kentucky native who spent many years living in Tennessee before recently relocating to Florida. She's been a reader and writer since childhood, working as a magazine editor/writer before leaving to write romance full-time. She was a Golden Heart finalist eight times -winning twice - before selling her first book in 2007. She's since published books in a variety of sub-genre, including young adult, contemporary romance, romantic suspense, and women's fiction. When she isn't busy writing, Trish is a self-described "National Park junkie," amateur nature photographer and enjoys cosplay and attending fan conventions such as DragonCon in Atlanta. Welcome back, Trish! It’s such a pleasure to host you today. We’ve missed you around here. Harlequin recently released the 12th book in your Blue Falls, Texas series: Her Texas Rodeo Cowboy. Please tell our readers what they should expect from this story. Thanks for having me here today, PJ! It’s great to be back. While Her Texas Rodeo Cowboy is officially the 12th book in my Blue Falls, Texas series, it’s actually the 16th story set in Blue Falls. The Teagues of Texas trilogy that pre-dated the Blue Falls books are actually set in Blue Falls, too. And there is a Christmas e-novella titled A Cowboy in Her Stocking. 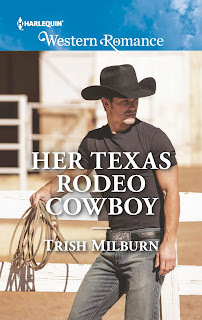 As for Her Texas Rodeo Cowboy, it’s the third book about the five adopted Hartley siblings. This one is about the oldest sister, Sloane. championship. And he can’t afford any distractions. Certainly not a blonde beauty with trust issues like Sloane. She represents everything a cowboy on the circuit can’t have anyway—home, family, a real relationship. Everything he thought he didn’t need. 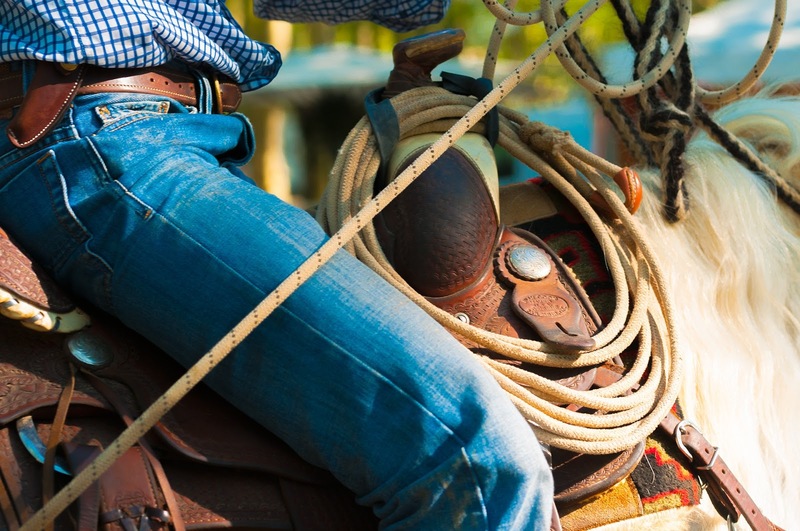 But when he’s with Sloane, Jason can’t remember why winning at the rodeo seemed so important. When you conceived this series, did you have any idea it would still be going strong? How many more books do you have planned for Blue Falls? You’ve done a wonderful job of creating a sense of place in these stories. What is it about this area of Texas that calls to you? Have you ever lived there? Thanks! I’ve not lived there, but I’ve been to the Hill Country several times, first with a friend who was at UT-Austin for grad school a number of years ago, and more recently with fellow author and dear friend MJ Fredrick, who lives in Texas. 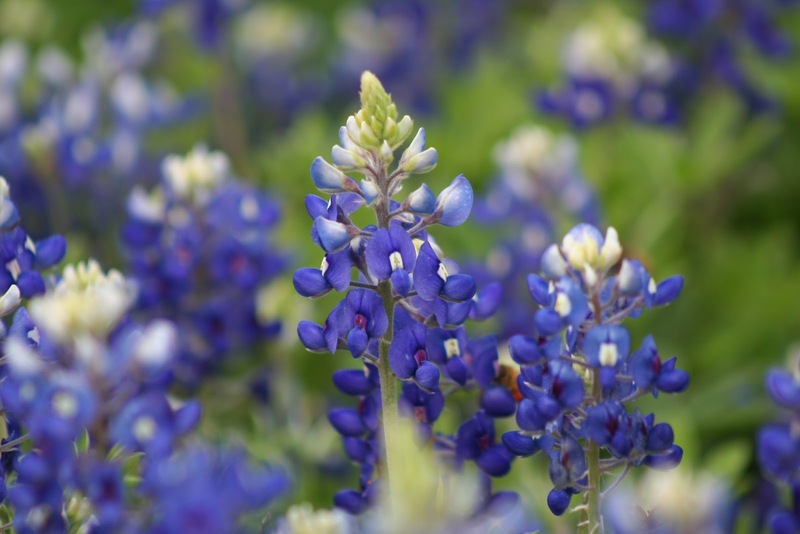 The Hill Country has a rich history and it doesn’t look like so much of flat, flat, flat Texas. It has a rugged beauty to it. It’s an interesting mixture of ranches, vineyards, tourist destinations, mom-and-pop businesses, German heritage, etc. I fell hard for Jason. I was drawn especially to his patience with both Sloane and the foster children who attended her camp. Who’s the last hero (not written by you) that you fell for? What made him special? You recently moved from Tennessee to the Florida coast. Will we see any beachy romances in your future? I really enjoyed your Starfish Shores novellas. I do plan to write some more stories set in Starfish Shores, especially since beach research will be super easy now since I live about two miles from the beach. I think they will be a nice break from my cowboy stories. But don’t worry, I don’t plan to abandon the cowboys. With Harlequin closing their Western Romance category line, where should readers look for future Blue Falls, Texas books? Twins for the Rancher will be out in March of next year. I also hope to be able to share some good news soon, but nothing is finalized yet. Thanks again for having me on the blog today. It’s always great fun hanging out with you, and it was so wonderful to see you at RWA this summer. Thanks for visiting with us today, Trish! Would you like to ask our readers a question? The Blue Falls spin-off series I’m planning is in a little town that is known for its antique/junker stores. I’d like some fun names for these stores. Any ideas? How about "Trash and Treasure," "Second Hand Rose," "Reconsiderations" or "Deja Vu"? Precious Treasures, Cherished Treasures, Treasure chest, Timeless Treasures, Antique Trove, One Upon a Time, Precious Past. Oh, I like Timeless Treasures and Once Upon a Time. Loved your post. Interesting names which I hope would be unique. Hope and Memories, Vintage Memories, Memory Lane, Good Old Days. Memory Lane has a neat feel to it. Thanks for the suggestions. 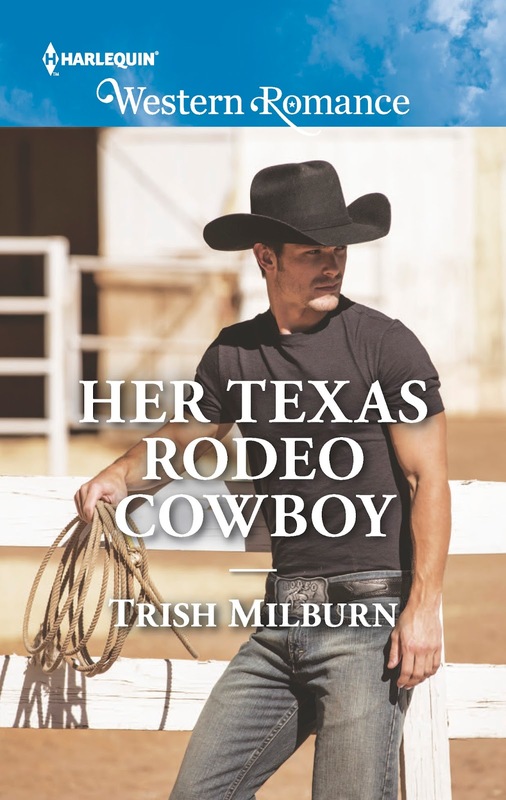 I look forward to reading Her Texas Rodeo Cowboy. Trish, Dress Me in Wildflowers is my favorite of your books. What are the chances that your readers will see more from you in that vein? My suggestions for names: Serendipity, Vintage Venue, Auntie M's Treasures, Grandma's Attic, Finds and Frivols, Fourth Chance. Thanks so much, Janga. My hope is to have some books out in a new series, hopefully within the next year, that are a bit more in the vein of Dress Me in Wildflowers, a bit more like Kristan Higgins' books, that nice blend of romance and women's fiction. Nice suggestions on the names. Congratulations on the new book. Some store names: A Step in Time, Hunk of Junk, Salvage Garden, Relics & Riches, Treasure Trove, Trash & Cash. That certainly fits a lot of these stores. Welcome back! There is an antique/junk store near me called Junk Mama's. Wonderful post. How about Pleasant Memories, A Blast From The Past or Golden Oldies. Thanks, Carol. Oh, with Golden Oldies, maybe I could have them playing older music inside, like stuff from the 1940s and 1950s. Gone But Not Forgotten; My Mama Had One Just Like That; The Good Stuff You Should Have Kept; Treasures of the Past; and finally I Wish I Had One Of Those. LOL! Awesome suggestions. I occasionally see articles about something that sold online for some crazy amount and think, well, I wish I'd kept that from when I was a kid. My favorite kinds of stores. We have found some interesting things digging through them. I like Junktiques. It sort of allows for the store to have stuff junkers like plus true antiques. Bygone Days and Antique Addiction. Antique Addition is one I've not seen before. Thanks!